Hi, Everone! Laurie Mika here! 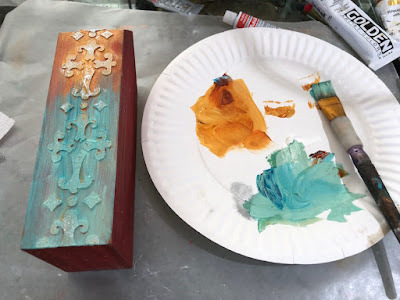 I love being able to use my border stencils in a variety of ways with a variety of mediums. 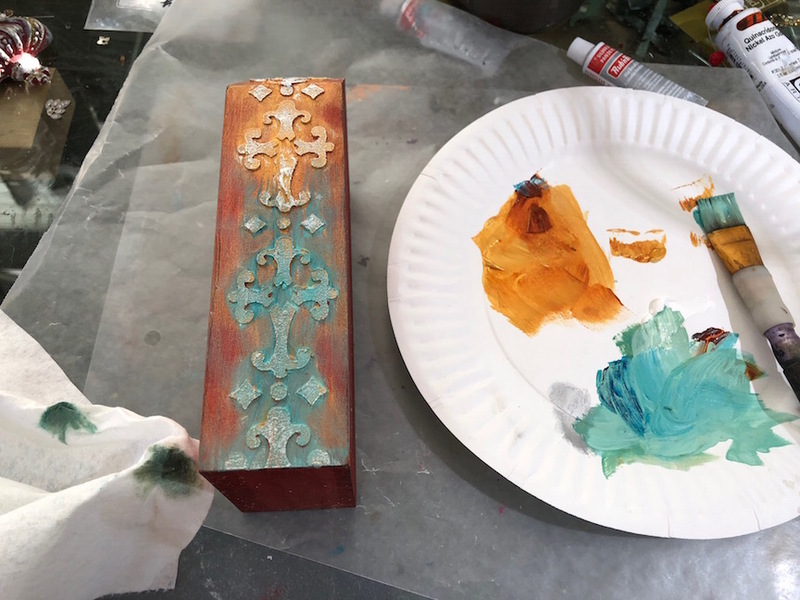 Recently I was working on a class sample for an upcoming class and wanted to share some techniques for using my stencils with molding paste to give a cool, raised, embossed look to the edge of my substrate. I have been doing a similar technique with foam stamps and mastic for years but was recently working with artist, Karen O’Brien (Imaginary Characters) who showed me her “credit card” technique that worked like a charm….so that is what I would like to share. 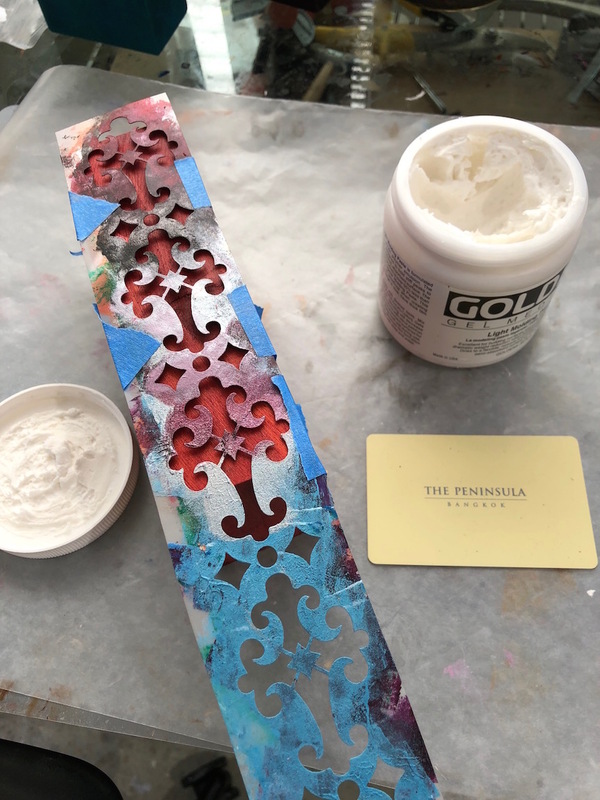 Using one of my Pilgrimage to the Renaissance border stencil, I taped it to the edge. 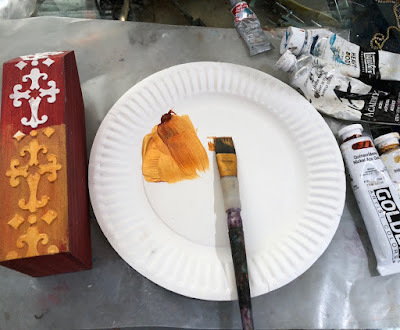 Fortunately, it fits perfectly on the 1.5 inch surface edge but I still like to tape when possible to avoid shifting of the stencil especially when applying a thick paste. The next step was using a credit card to apply a coat of molding paste over the top of the stencil. I used Golden’s Light Molding Paste. You can decide how thick you want the embossed image to be by how much paste you apply or remove using the credit card. 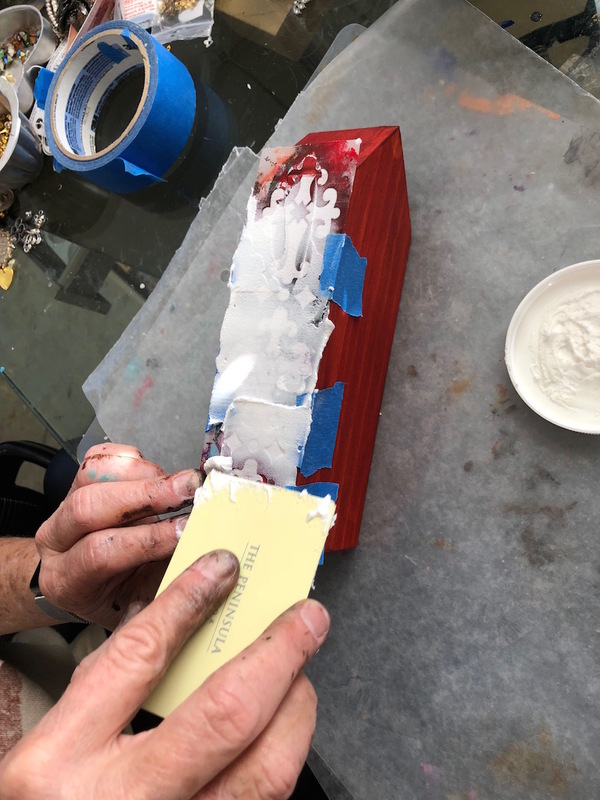 I really don’t give it much time to set up….just a minute or two before I carefully lift up the tape and remove the stencil for the big reveal! I live in San Diego where today it was nearly 80 degrees in February….so things set up fast! If you live in Minnesota where it was 6 degrees today, you may need to let it set up longer! Below is a picture with the stencil removed. 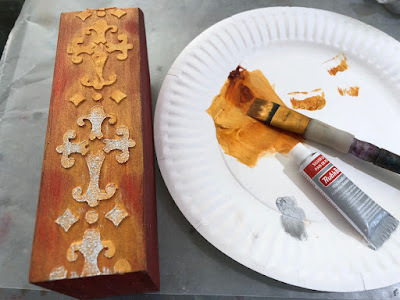 Make sure to use warm water and soap to clean the paste off of the stencil. 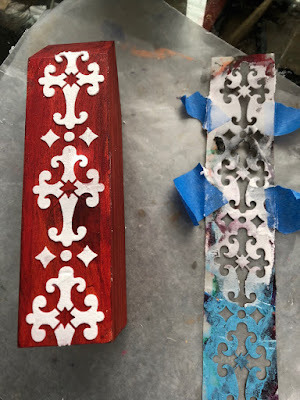 Also it is good to note that this technique would be hard on your stencils that have super fine details. 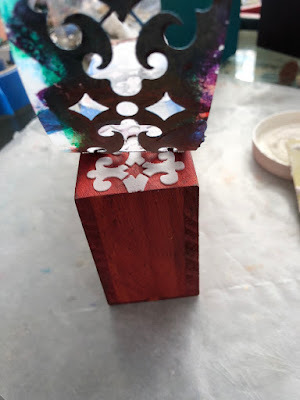 Best to use stencils with simple designs. In order to achieve the rusty, crusty look I wanted, I used layers of paint. After the molding paste dried, I applied a base coat of Quinacridone Nickel Azo gold mixed with metallic gold paint. 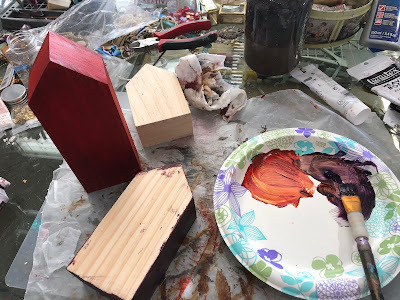 I dabbed off some of the paint using a rag, especially on the edges around the raised areas. 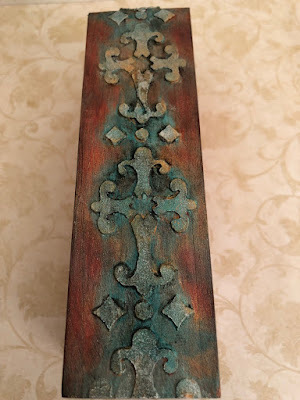 I love Rub n Buff and use it on everything….so of course, I used it on the stenciled area to give it a metallic look. Surprisingly, it also helps it look old and crusty in the final product. I just added the silver Rub n Buff to the raised areas. 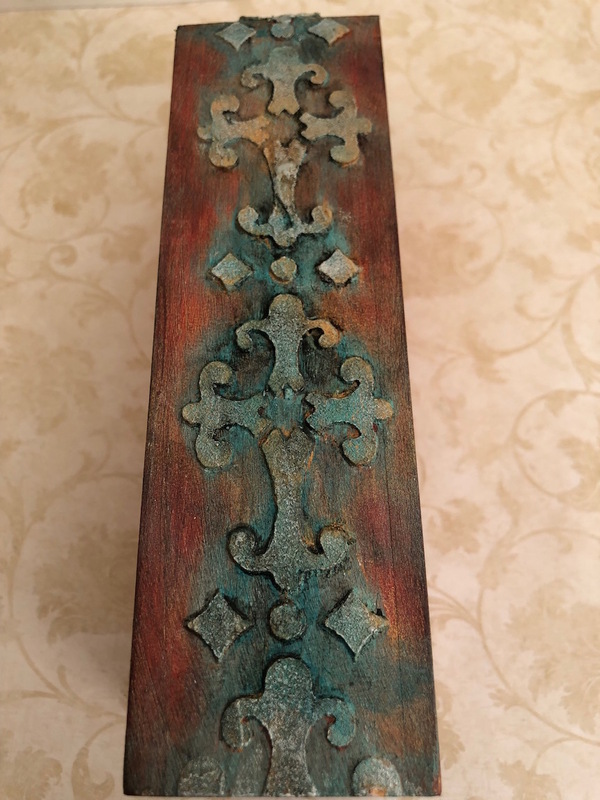 The next layer of paint adds the oxidized look. I mixed turquoise deep paint with a bit of white and Quin gold paint to get a great color that instantly adds a patina to whatever you apply it to. 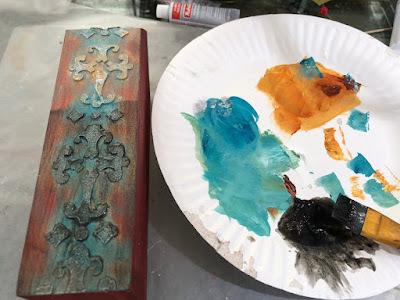 Again I dabbed off some of the turquoise paint so that the orange/gold color showed through. The last layer of paint was a watery layer of black paint that was brushed on so that it pooled around the raised stenciled area. I then quickly dabbed off the excess paint with a rag. Here are detailed photos of the final piece and also the entire side of what the finished edge looked like. 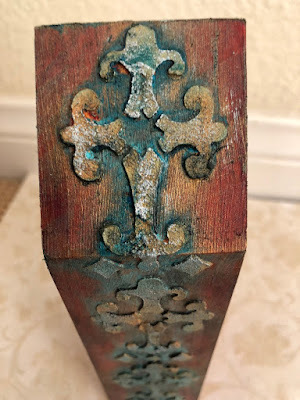 This is a very cool technique that adds fabulous texture to your work and that also has many cross-over applications in mixed media. You can find all of Laurie Mika's StencilGirl stencils HERE. 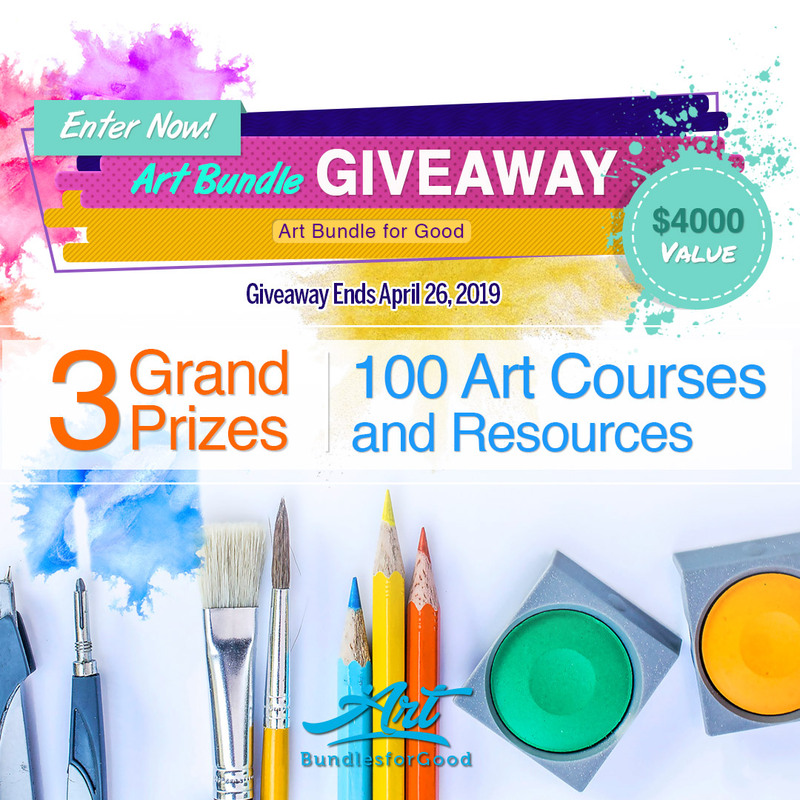 Learn more about Laurie Mika and her art by visiting her website at www.mikaarts.com. Neat project and technique. Thanks for sharing! This is absolutely gorgeous! I love the colors, texture and stencil design. Beautifully done!